Early voting has been steadily increasing over the past 20 years. While different data sources come up with slightly different estimates, the Current Population Survey’s Voting and Registration Supplement shows that the level of early voting has tripled since 1998 in midterm elections, and has gone up two and half times in presidential years. If the levels this year are 30% or higher, it will be the most in any midterm. It’s unlikely that this year’s early voting rate will hit the 2016 level of 39%, but it’s possible that we might approach it. It is a problem that we have partisan-elected secretaries of state as the chief election officers,” says Rick Hasen, a professor of law and political science at the University of California, Irvine. Of course, this issue is magnified by having the chief elections officer running for higher office, simultaneous with sometimes important–and politically fraught– decisions that have to be made about eligibility for the registration rolls, times and places for early voting, allocation of election machines and poll workers, even potentially decisions about recounts (this latter issue is what caused a controversy in the Republican primary for Kansas governor involving Secretary of State Kris Kobach). 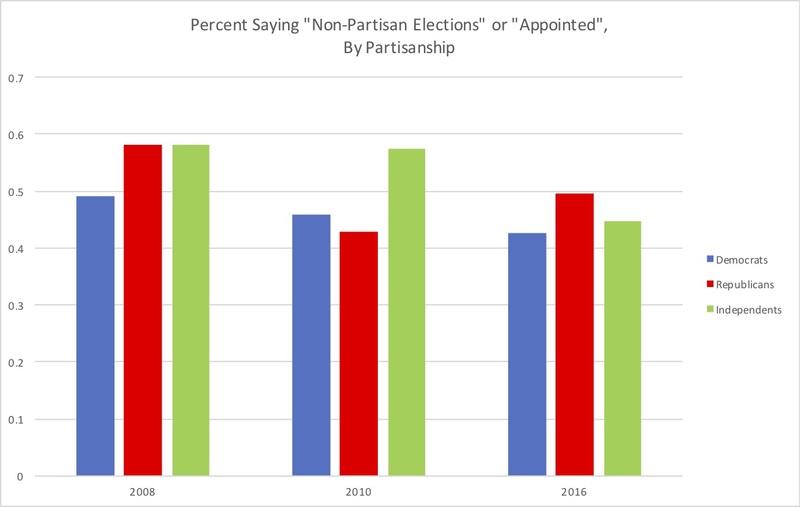 We’ve been studying voter attitudes about the partisanship of election officials since 2008, and at least as far as the public is concerned, there’s really not much of an issue. 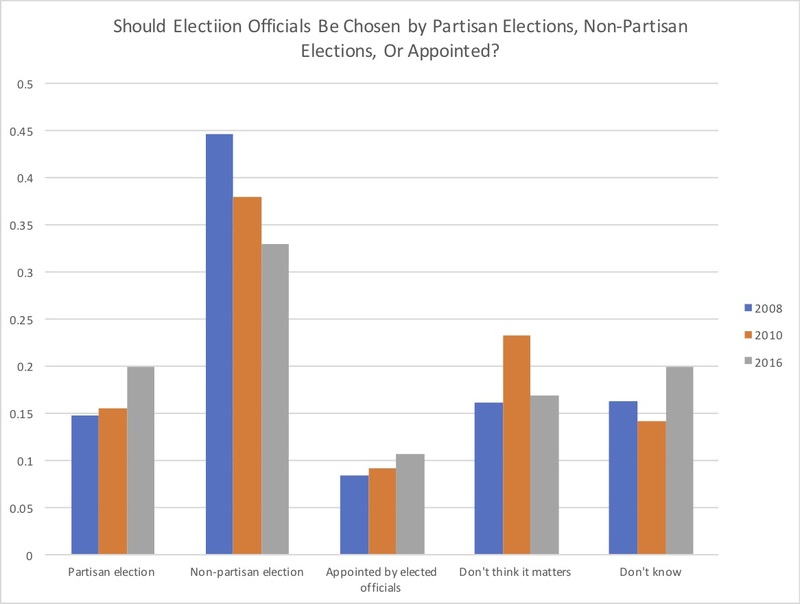 Less than 1/5th of the public endorses the statement “election officials should be elected by the public, in a partisan contest.” About half the public thinks that the election officials should be elected in a partisan contest or appointed. The percentages who endorse an appointive or non-partisan elective method doesn’t vary much by party. This is one of the few things that hasn’t been caught in the “voting wars” — a plurality of the public thinks that election officials should not themselves be elected. In a new report that I co-authored with Natalie Adona of the Democracy Fund, we made a very similar point about trust and confidence in election officials. There, we showed that election officials enjoy a high level of public trust, nearly comparable to the Supreme Court (when we asked in 2008), and well above more “political” institutions like the executive branch and Congress. Election administrators enjoy higher levels of public trust when compared to officials in other public institutions. State and local election officials should continue to enjoy high public approval if they are viewed as nonpartisan experts. Whether you are a Democrat, Republican, or Independent, and whether you support Brian Kemp or Stacey Abrams, you should be concerned when the integrity of the election system gets caught up in a polarized political environment. Carroll Doherty of the Pew Center recently argued that, while American support for democracy remains robust, there are some dark clouds on the horizon. If Americans believe that elections are being administered unfairly for partisan motives, these dark clouds can quickly turn into a downpour.